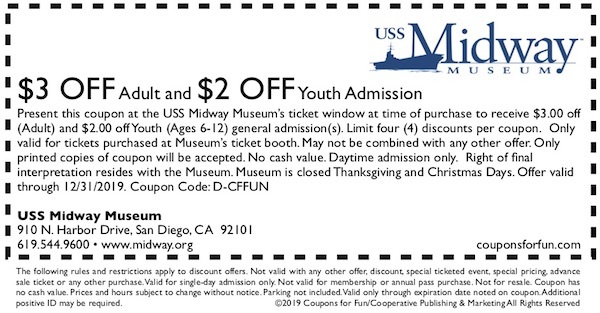 USS Midway Museum in downtown San Diego, California - Get coupon to this enormous aircraft carrier! Located in downtown San Diego, the USS Midway (Museum) was America’s longest-serving aircraft carrier of the 20th century. Today, the interactive museum is an unforgettable adventure for the entire family as guests walk in the footsteps of the 150,000 young men who served on Midway. Visitors explore a floating city at sea, the amazing flight deck and its aircraft, flight simulators, and are inspired in the Battle of Midway Theater. Admission also includes a self-guided audio tour narrated by Midway sailors in English, Mandarin, Spanish, Japanese, French and German. Visiting Midway is a once-in-a-lifetime experience in San Diego, known around the world as "Navy Town, USA."